Chinese Mid-Autumn Festival is one of the important festivals for Chinese. In Singapore, the main festive food to celebrate Mid-Autumn is the mooncake and you could probably see stores selling varieties of mooncake way before the actual day. As a festive food craze, I loved mooncakes very much! Yes, I would eat at least 1 mini sized or half the regular mooncake every other day once the mooncakes were available in the market. I loved mooncake of all flavors, both the traditional baked and chilled snow skin mooncakes. And this year, I was lucky enough to travel to Hong Kong during the festive season. Hong Kong certainly is the city with all great food, including mooncakes. They do celebrate Mid-Autumn extensively, too. 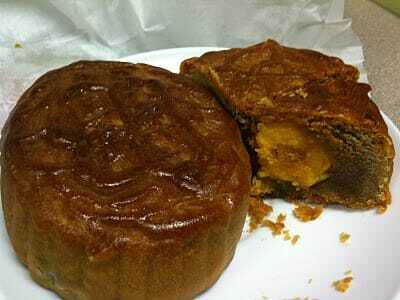 Traditional baked mooncake from Da Zhong Guo Chinese traditional bakery shop. Simply loved the simplicity of the packaging. The traditional way of wrapping the mooncake with paper, instead of putting it in a box. Its skin looked deceptively dry, and less refine. In fact, it was tender, moist and delicious. The lotus paste was smooth and moderately sweetened. We had the white lotus paste with double yolks. The filling was less sweet. Baked mooncake from Tupperware: Bought the mooncake set that comes with Tupperware container and a mooncake in it. Hong Kong Lian Xiang Lou 蓮香樓 is well-known for their lotus paste. So, I got one of their traditional baked mooncake. The single yolk bake was sold out when I was there. So, I bought the double yolk type. I was quite certain that the lotus paste would be smooth and tasty since I tasted their lotus paste steam bun before. Baked mooncake from Season’s bakery: A gift from my activity club. It’s lotus paste with singke yolk. Shanghainese mooncake from Shi Zheng Restaurant: This was one of the best mooncakes. It topped my list. Shanghainese mooncake. It’s deep-fried flaky crust mooncake, with filling of fragrant pumpkin paste in the centre and surrounded by silky smooth yam paste. One of the nicest Shanghainese mooncakes I have even tasted. Lotus Paste Pandan Snow Skin made from Mid-Autumn Festive Carnival. It ranked the 2nd in my list. Snow Skin mooncake, with custard filling. The filling wasn’t soft and runny as it was chilled. Snow skin had to be chilled. It was from Maxim’s Bakery. Bought also other flavors during the last trip to Hong Kong. Tiramisu with cheese. Loved it! Snow skin mooncakes with mango filling seemed really popular in Hong Kong. I got this 芒果脆脆 (mango crunch filling). Mango crunch, mmmm… Couldn’t wait to try. Mooncakes from Hong Kong were much more interesting than those sold in Singapore. The flavors were just so exquisite. Alas. I was hoping you were going to leave mooncake recipes for us to savour! I had mooncake recipes in my blog since ast year.. Check them out!